Despite a two-year stint as a vegan in high school, I could never really be a vegetarian. For one thing, sushi. 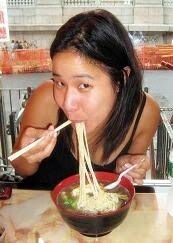 For another, spicy beef noodles. But mostly, even though I'll happily eat several meatless meals a week, I often just don't feel that full after eating a vegetarian meal. And my meat-loving husband feels that way times ten. That said, we live in San Francisco, and we love having people over, so it's good to have some vegetarian-friendly dishes in one's repertoire. 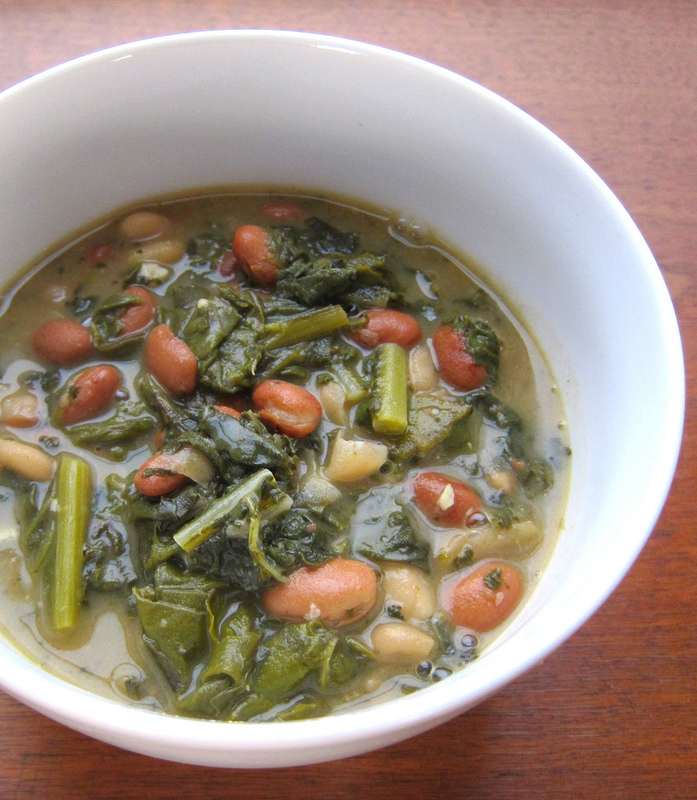 I've long loved the idea of a simple beans and greens dish, but my versions always came out tasting a lot like "health food". Then I went to a friend's barbecue and wolfed down a truly impolite amount of her savory, satisfying beans and greens. The secret, she told me, was Parmesan. Now having made this dish three times myself, I feel that the secret is overcooking the veggies in a way that goes against everything I normally do with greens in the kitchen. I'm of the California school, I usually just "show the vegetables the water." In this case, you want the vegetables to braise slowly for at least two hours, breaking down and giving up their flavor to the unctuous, garlicky sauce that surrounds the beans. A bowlful of these slowly cooked beans is creamy, comforting, and very filling. This is a super adaptable dish, and not even really worth a formal recipe. Pour a splash of olive oil into the bottom of a Dutch oven and saute 3 or 4 minced garlic cloves for a minute or two. Then dump some canned beans and a lot of well-chopped veggies. Add enough water to cover the beans (but not the vegetables, which will cook down) and bring to almost boiling, then turn down to a simmer for 2-3 hours. The vegetables should be meltingly tender. Stir in a handful of Parmesan just before serving if you like, but I find it's plenty rich and satisfying without. Generally with vegetarian chili and other bean dishes, I find that mixing multiple varieties of beans adds interest and variation and makes the overall dish tastier. I used one can of pinto and two of cannellini, but chickpeas, kidney beans, and black beans would work fine as well. Just use what you have. The version pictured above contains one bunch of beet greens and one bunch of lacinato kale, but chard, spinach, or any leafy green would work great here. The key is to cut the veggies fairly small and cook for a long time over low heat. This pic is from the first time that I made the dish, but I would cut those stem pieces even smaller now. The greens should just disappear into the dish. My husband, who likes neither steak nor potatoes, loves salad. He also hates watching sports and loves going dancing. Yes, we sort of live in opposite land over here and it's pretty great. What's not so great is that with the closure of Ti Couz, there's no place near our house where we can get a big heaping bowlful of salad. You can't go 20 feet without hitting a giant salad place in the Marina, but we live in the Mission, land of taquerias, incredible Italian restaurants, oh and this little spot. Anyway, it's hardly like making a giant salad is a chore, particularly in these days of prewashed greens. 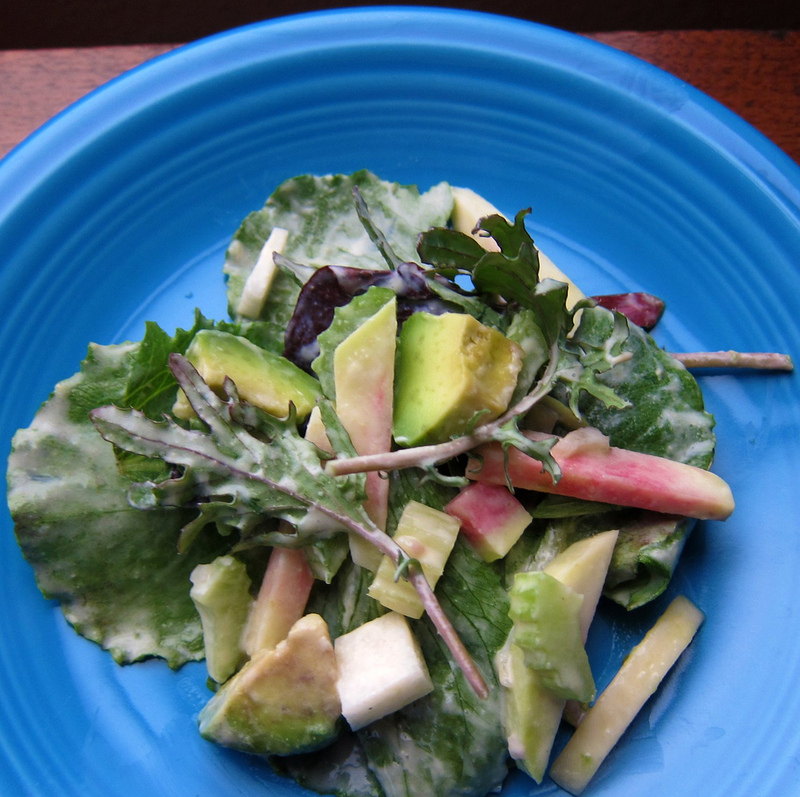 I wanted a cool, creamy dressing to offset the crunchy bits in this salad. This picture was really speaking to me, but the mayonnaise and the sugar were making me cover my ears with my hands and yell "nyah, nyah, I can't heeear you." So I tweaked the dressing into something a little tangier. 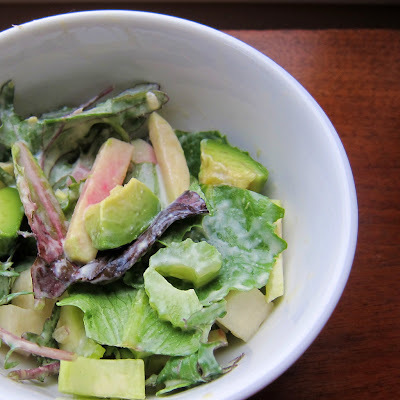 The secret, of course, to a yummy big salad is to toss the salad in a huge bowl until the dressing completely coats every last leaf of lettuce. To make a meal of this, you can serve it with some spicy grilled chicken on top. I just grill pieces of chicken thighs with a pinch of salt, about a tablespoon of hot sauce, and a couple shakes of ghost pepper sauce for some real heat. Now that I'm on a big salad kick, I'm really looking for some great dressings. I love the one below and this lemon truffle vinaigrette, but if you've got a favorite dressing recipe, please comment! Place ingredients in a large bowl and whisk until completely combined. Dress salad right before serving. 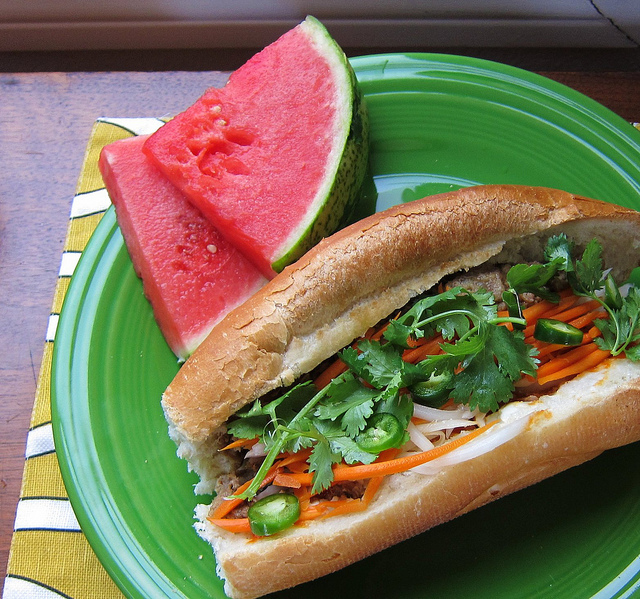 It would seem my julienne mandoline is my chattiest kitchen gadget, because in addition to urging me to make green mango salad, the other day it pretty much demanded that I make banh mi from some leftover carnitas. It's going to ask for some bibimbap one of these days, just you wait. Carnitas is super simple to make—you won't find a better explanation than Homesick Texan's—and leaves you with oodles of tender yet crispy flavorful pork. The first night, I served it with tortillas and black beans, and rice, and loads of spicy green salsa. I recommend cutting back or even omitting the sugar from most pickle recipes. You can always add a pinch of sugar later, but honestly, I've never thought, "The problem with these pickles is that they're not sweet enough." The only other important ingredient is a fluffy white baguette. Strangely the Mission Mexican markets around me all stock Vietnamese french bread. Otherwise, I would recommend giving the loaves at your local market a quick, surreptitious squeeze. You're looking for light, squishy (not dense) bread. 1. Run your veggies over a julienne mandoline, being very careful not to cut your fingers. 2. Place them (the veggies, not your fingers) in a container with pickle brine: 1 cup of piping hot tap water, 1/2 cup rice vinegar, 2 teaspoons kosher salt, small pinch of sugar. 3. Pickles are ready to eat in 24 hours. 1. Slice the baguette in half. Spread with mayo and sriracha, then stuff with carnitas and stick it under the broiler for 5-6 minutes until bread is slightly crusty and meat is reheated. 2. Remove from oven and scatter over pickles, jalapenos, and cilantro.